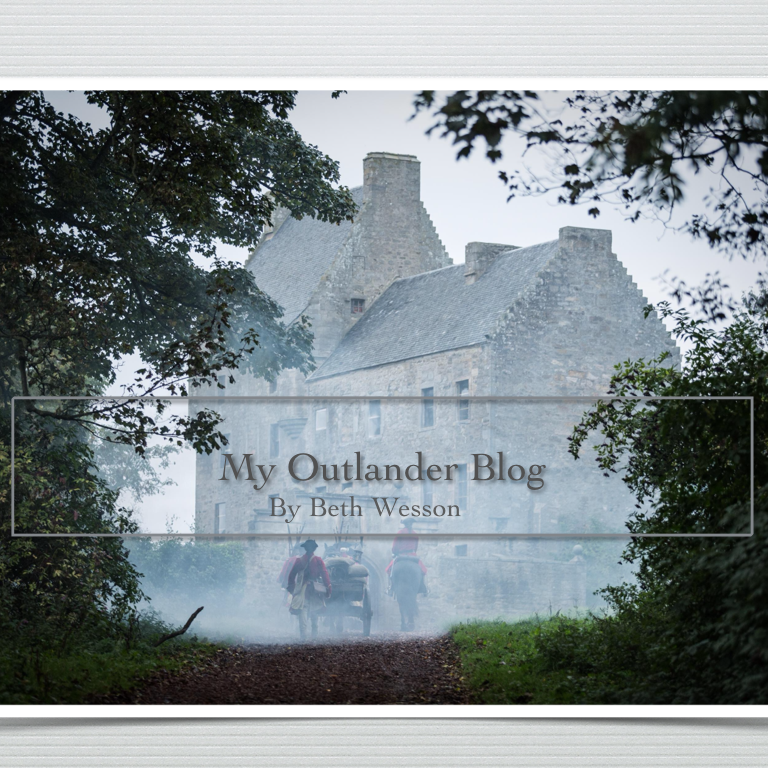 “The ties that bind”…Claire and Jenny…Outlander in Episode 12 – My Outlander Blog! There is a lot of talk on the web about Outlander episode 12. I’ve addressed the issue of Jamie and his “Laird-ness”, but didn’t really discuss the other hot button issue and that is the portrayal of Jenny and Claire’s relationship. There seems to be two bones of contention in the Outlander fan world: “Why is Jenny such a bi**ch ?” and “Why on Earth would Claire feel like she might belong at Lallybroch?” From what I can gather, there is concern about how Jenny welcomes (or doesn’t) welcome Claire into the fold. I think I saw the answer to these questions in the episode. 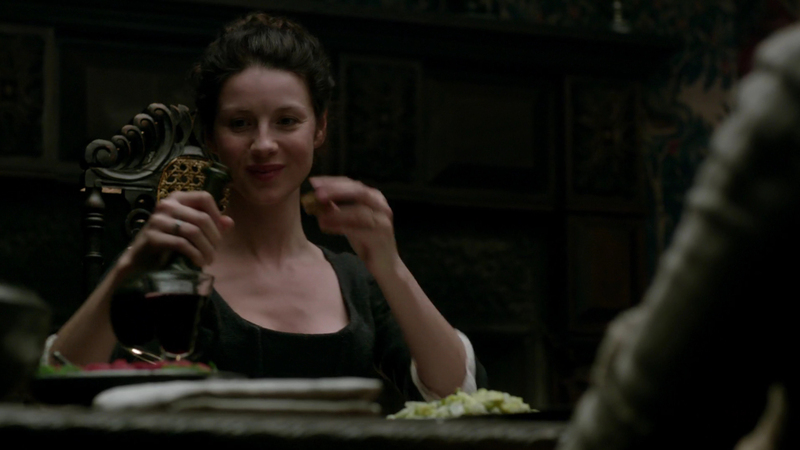 Let’s start with Claire’s first look at Lallybroch. Thank God for good acting because the subtle performances in this episode were stellar and oh so revealing of what the characters were thinking without the benefit of a voice-over. At first sight, both Jamie and Claire are awed at the vision of Lallybroch on the horizon (I was too!). For the first time in years, Jamie sees his estate and you could read the “there’s no place like home” look on his face. It was a mixture of longing and pride. Claire, who had just made the monumental choice to stay with Jamie and all that means, is seeing what she believes is her new home. In fact, she is looking at the first real home she has known since childhood. It must have seemed like a fairy tale castle to her. “It’s just as you described it.” she breathes with wonder. Quickly, however, we see and feel the mood change. As wonderful as it is to be home, the place currently holds some painful unfinished business for Jamie. He puts on his “battle face” as he grabs the horse’s reins and his courage and heads down hill to face his fears. 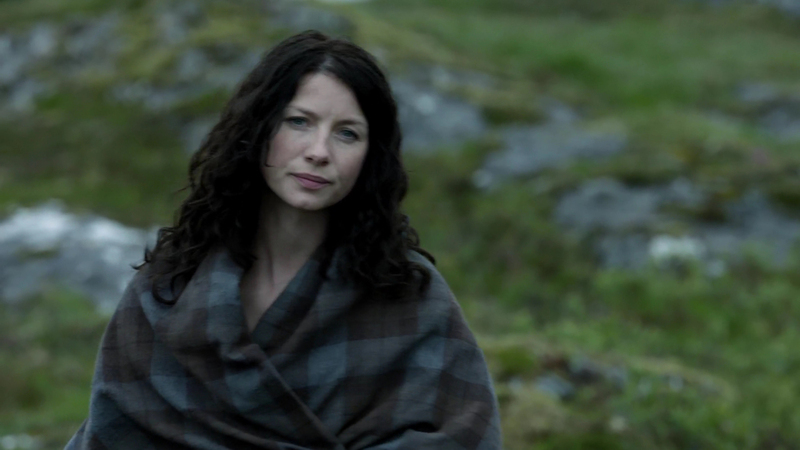 Claire gives a moment’s look of concern for the change she senses in Jamie, but then gets lost in her own fears. 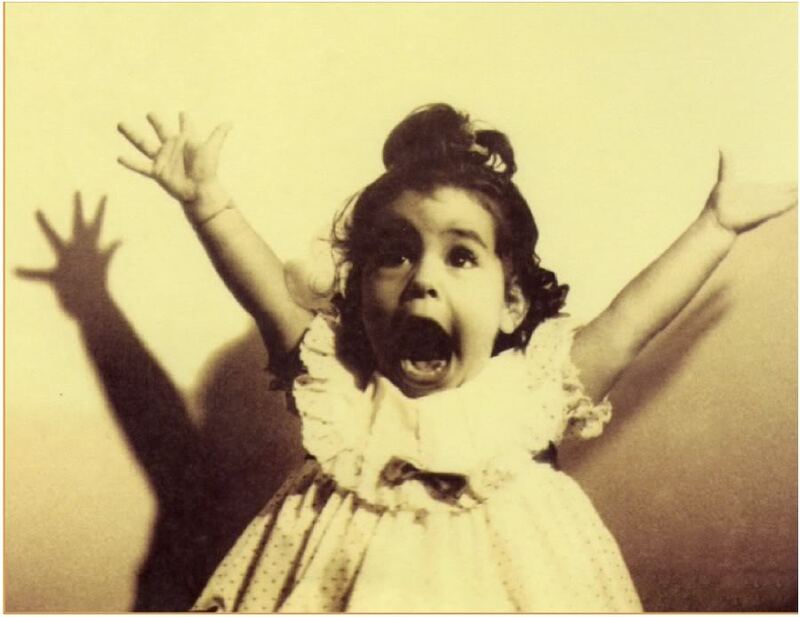 For the merest of seconds, the camera lets us see her mixed emotions race across her face. Claire has her own issues to face at Lallybroch. 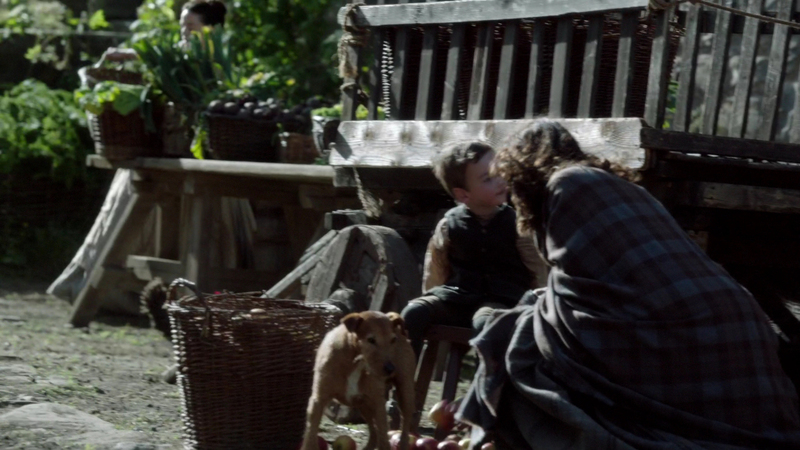 They arrive and the first person Claire meets is wee Jamie. Claire’s response is to get down on the child’s level and introduce herself. I couldn’t help but think what this small gesture reveals about Claire’s character. She doesn’t look around at the estate she has just inherited instead she gravitates toward what is important to her…the people she inherited. 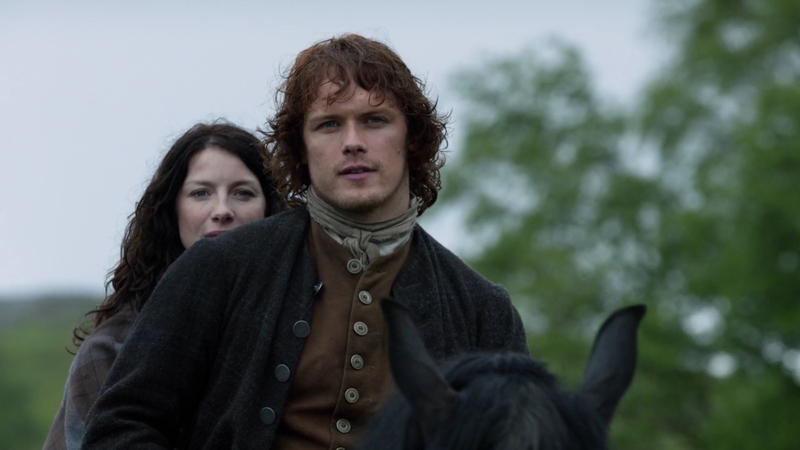 Claire is a healer and there are people here who need her…Jamies’s people. She may have to deal with what it means to be “Herself”, but the potential to fulfill her life’s purpose is here. She has a flock and family to care for. Claire being who she is tries to intervene and help make peace between brother and sister. What she gets for her efforts is her first real taste of what happens when you get between two Frasers when their dander is up. She got “bit for her efforts”! I laughed out loud at the “Trollop” comment. 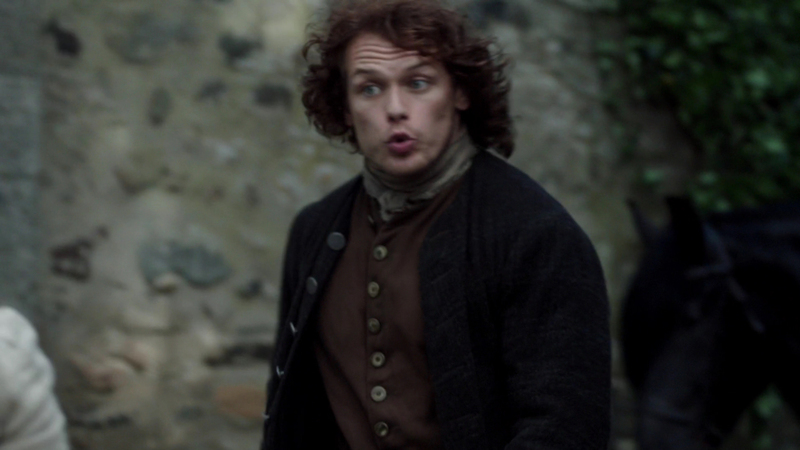 It wasn’t really meant to hurt Claire (ok, maybe a little), but more to hurt Jamie. In my opinion, Jenny still grabbed her brother by the balls. Siblings know what buttons to push and right where to “grab” to get our attention. If you watch Claire’s face in the background you can see her concern and then resignation. When she introduces herself to Ian as the “Trollop” you can see Jenny stiffen. Claire wasn’t crushed…she was amused! I bet that surprised Jenny, who I think was a little ashamed of her behavior, but it was too late, it was already out there. Jenny’s stubborn pride is being fueled by anger and guilt. She might know she’s being unreasonable, but she just can’t seem to stop herself. God, how true to life! Haven’t we all said things we really didn’t mean or acted a bit passive-aggressive a least once in our lives when we feel hurt? I think Claire likes Jenny. 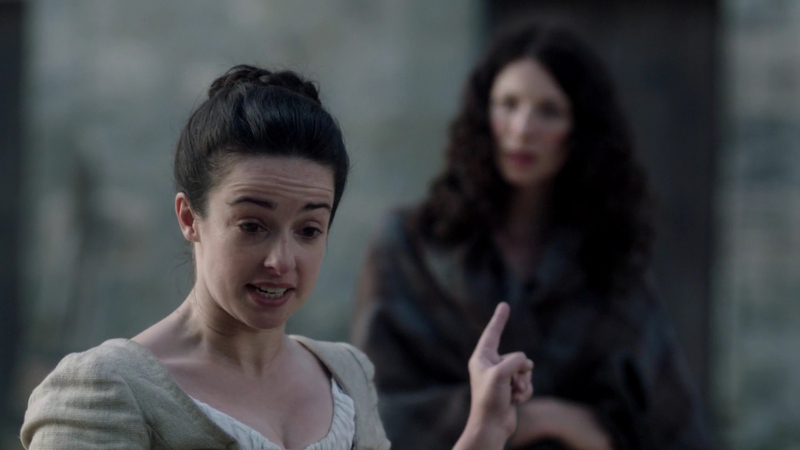 If you watch there is constantly either a look of concern, respect , (even though Jenny is being a “pain in the arse stubborn mule”) , or a small smirk of amusement on Claire’s face. She even sticks up for her sister in law which just irks Jenny. She tries to needle Claire with thinly veiled insults, but Claire will have none of it. They are testing each other! It might not be the exact words from the book, but the character development is there. Need further proof of the mutual respect that is slowly building in this episode? Rabbie Mc Nabb. Resentment seems to have taken a backseat to their mutual concern for this young boy. They get each other. I believe in the next episode, we are going to see this relationship blossom. Will Jenny continue to be a pain in the arse stubborn mule? Probably. But, Claire will tolerate it when she can for several reasons, but the main reason, the tie that truly binds these two women together is their mutual love of one James Alexander Malcolm McKenzie Fraser. When Claire is standing in the window looking at the “North facing tower”, chuckling about Frasers, the viewer and Jamie recognize something has changed. 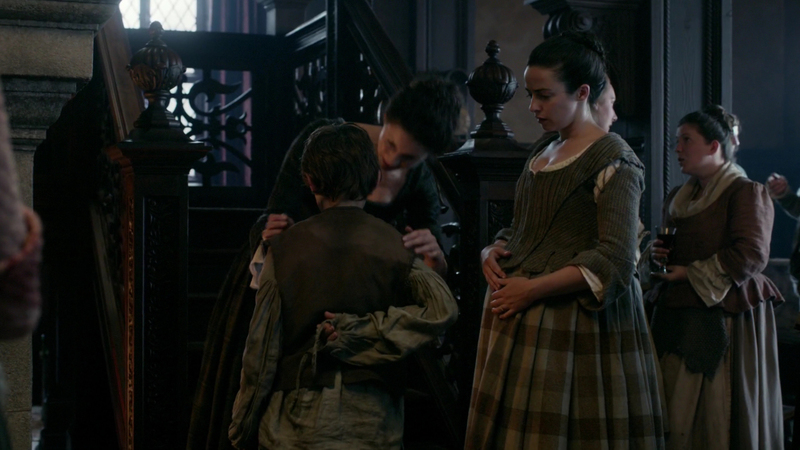 Claire tells him she is starting to believe she could belong at Lallybroch. Besides the reasons I’ve stated about having a place and a purpose, I think one of the reasons she feels she belongs here is BECAUSE of Jenny. What other woman has Claire met that so reflects her own values? What other woman has she met that is strong despite her surroundings? (I guess you could say Gellis, but her values didn’t really match Claire’s) What other woman has she met that she could see as an equal? Jenny is smart, quick-witted, caring, loyal, and respected. And…she loves Jamie as much or maybe more than Claire. 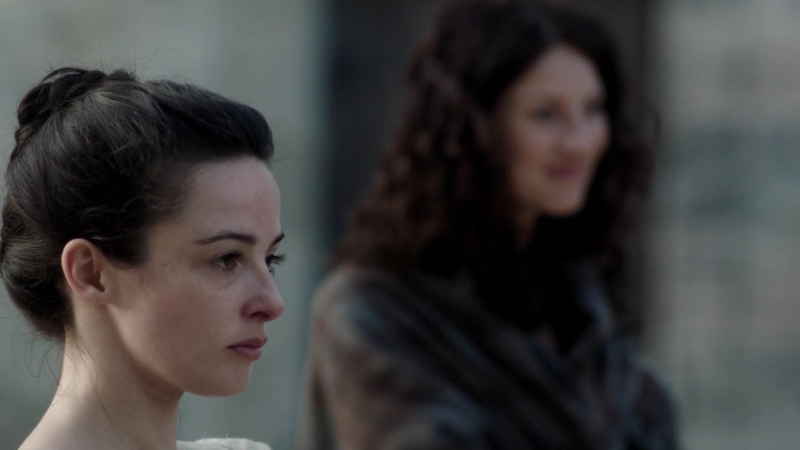 Yeah….I think we will see the respect…friendship …and… love grow between Claire and Jenny in Episode 13! Note: Did you notice Claire finally got her vase? Gave me the feels! Thank you for getting us ready for the next ep. I fear her vase is going to get smashed very shortly. Yes, Claire probably recognizes somebody much like herself in Jenny. I didn’t care for her much later when she drove Claire away on purpose. I was supremely mad at her for suggesting you know who after Culloden. I only softened to the character after her own personal loss. I was sort of surprised how quickly Claire was able to forgive her. Understand totally! I still haven’t forgiven her for the whole “Leery” fiasco! Jamie knew who put that ill wish under the bed. This time Claire is likely to inform Jamie of her part in the witch trial. Think there has to be a departure from the book version ahead. But did you hear Season 2 is only going to be 13 eps? I don’t know how they’ll manage… I am so happy to have found you! I’m not sure how they’ll handle that either?! Yep did hear about 13, but maybe they’ll find they need more! I didn’t notice until someone told me! Had to rewatch this episode for a 3rd time before I caught it! Thanks for mentioning this. I like your take on Jenny, and I agree with you. Re: Jenny’s machinations in later books, I always thought that Jenny felt betrayed on Jamie’s behalf for Claire’s 20 year absence. It didn’t immediately occur to me that she felt Claire had abandoned her too. If she considered Claire a friend and a sister, it’s no wonder she was angry. She perceived that Claire was waltzing in like nothing had happened. Of course there was a good explanation, but Jenny didn’t know that then. Mary, I totally acknowledge what you say here. But do you recall Jenny saying why she preferred You Know Who over Claire in a much later bk? Basically w a wife who is from that area Jenny felt that Jamie would stay tied to the land. She shared similar sentiments when Jamie was apparently forming a romantic attachment to a French woman while he was studying in Paris. Didn’t help Claire that she’s an outlander. 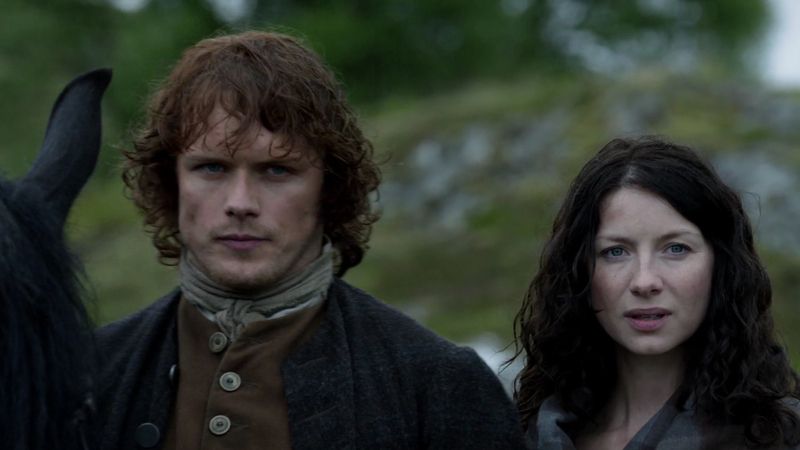 Yeah, those Frasers are fiercely protective of one another. Thanks! Love hearing from folks! I enjoyed reading your very gifted take on this AND I enjoyed everyone comments. I think I was stunned at the L’Her situation later on, but it also gets explained well. Loved your commentary on Episode 12. You caught all the nuances! And yes, Claire finally got her vase. The pleasant surprise, the second and third glances at it and then the big smile….”I AM home!”….is what it pretty much implied. That’s what I think too! Very symbolic! Thank you! There should be a button somewhere on the sight that allows you to follow. They send emails when anything new is posted! Glad you found me thanks for reading! Keep ’em coming, Beth! I really like that you came back to this episode to address the Claire/Jenny dynamic. I thought that the development was close to the book for their brief acquaintance at that point in the episode and agree that we’ll likely see even better development in the next episode! And, NightShadeMary, I wholeheartedly endorse your opinion of how Jenny feels later in the story! Really enjoy all the insights and respectful discussions! Beth, I love your posts and all the comments. It is kind of civilized over here. I have enjoyed reading posts on Outlander Series on Facebook but it gets pretty nasty sometimes! Great insights all around as usual. I am sure we will see more development of Claire & Jenny’s relationship next week, yes. And I think a lot of non-book readers thought Jenny was bitchy and Ian a weak background character. As a book reader, I knew better–but I don’t think it came across well in the episode. 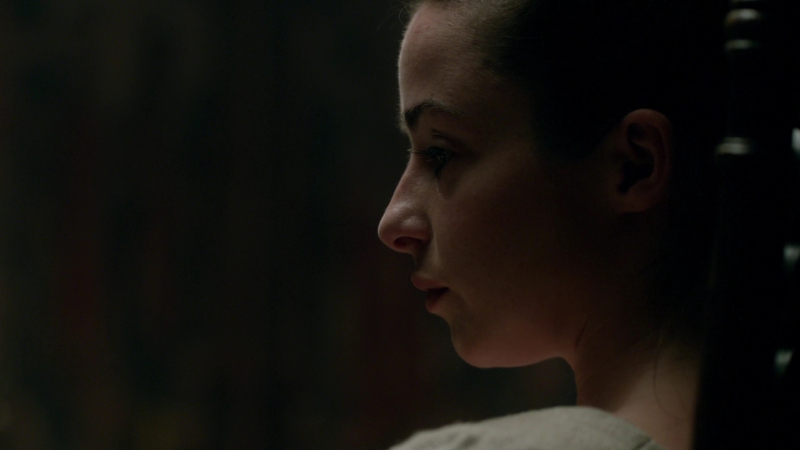 I absolutely love Laura Donnelly as Jenny. I think the casting is spot on, and the prior friendship between Sam & Laura translates well with onscreen chemistry befitting siblings. She is perfect. LOL! literally beaten to death! How great! Yes, I don’t always see why they choose some scenes and not others and have often wanted to be in that writer’s room to give them my two cents! I love that they have given us a show that we can discuss! It could have gone sooooo wrong. (Hugs to you) I got an offer today to be a groups “official blogger” giving it some thought then would you mind if I bounced my thoughts off you! I think I’m going to need help deciding. I am so glad that someone else “got the vase” thing! I felt it was very touching! I am really loving this series! I have read all the books and now having a visual pulls it all together! Isn’t it great! Thanks for reading! Non-book reader reporting in. Book readers can stop worrying about us so much. Thought both Jenny and Ian were reasonably well developed. Jenny had every right to be bitchy after Jamie’s hasty accusations so I felt her behavior was more than justified. The cemetery scenes round out her character and motivations beautifully. And while Ian didn’t get much attention, I know he’s kind and thoughtful and strong, thanks to the scene with Claire at the paintings, and I love him already. I even got the vase connection because Claire looked so clearly, though very fleetingly, moved. I love the series and, as a result, will read the first book as soon as it’s done. Thanks for taking the time to write! I love hearing non-readers perspective . I find it very difficult to look at the show objectively. I try! But it’s hard. You will love the books. give the first a little time! things really pick up after the stones. Keep me informed! I’d love to hear what you thought of the show and books! Thank you, Beth. I think non-readers have an advantage because we can focus on what’s being presented without distraction. But I want to express my sincere thanks to all you book readers because this wonderful series might never have been made without you. I’m sure I’ll love the books, too, and it’s getting harder and harder to wait. I already have the first one. I’ll certainly keep you informed.